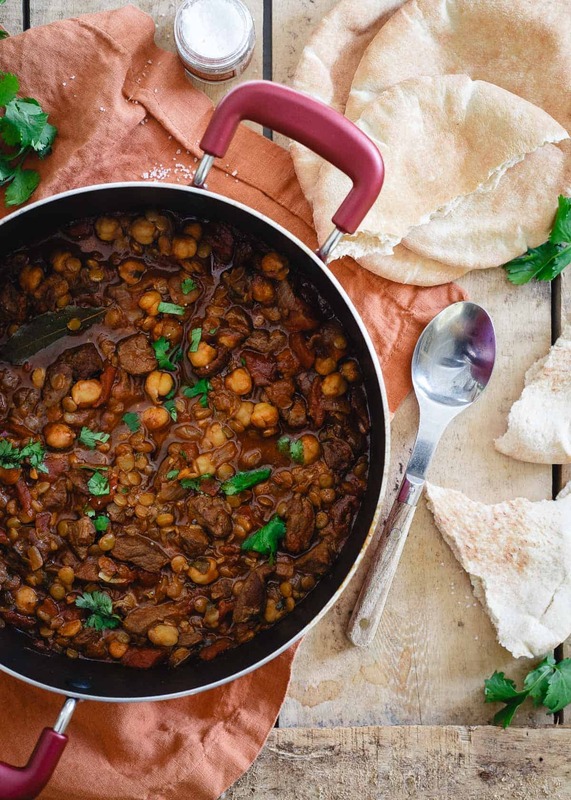 This lamb lentil stew is flavored with Moroccan spices and beefed up with chickpeas. Serve with fresh cilantro and a dollop of yogurt for a hearty and comforting winter meal. 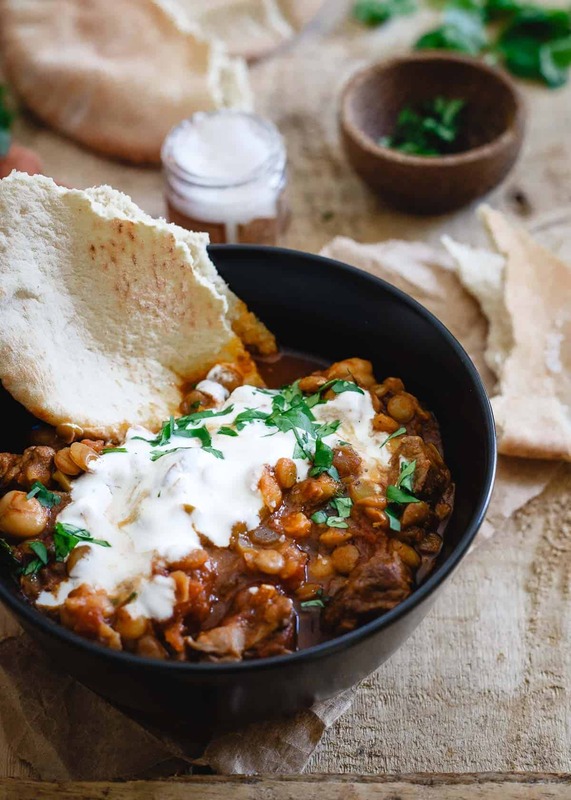 *This Moroccan Lamb Lentil Stew recipe is sponsored by USA Pulses & Pulse Canada, a 2017 partner of Running to the Kitchen. There are things about my husband that had I known before we were married (and I don’t know how I didn’t because we dated 7 years before that happened) I’m not quite sure I would’ve gone through with the whole thing. Things like the fact he doesn’t like 99% of chocolate desserts (whaaa??? ), or that he’s got a serious case of germophobia and eats things like french fries and pizza with a fork (so awkward when we’re in public). The list of these little quirks goes on and on but this time of year, the one I have the most issue with by far is his hatred of stew. Stew is awesome. It’s almost always a one-pot meal. The base ingredients are things I always have in my pantry. It’s comforting, hearty and the possibilities and flavor profiles are practically endless. My mom made two types of stew when we were growing up: beef stew (big carrots, chunks of potatoes, you know the kind) and veal stew. Pretty sure they were both from her Joy of Cooking cookbook and she never deviated. So, on one hand I can sort of understand his weird aversion because I tend to stay away from both of those types as an adult after a few too many of those meals as a kid but for him to throw the word “hate” on the whole category of stew just isn’t fair. For example, this Moroccan lamb lentil stew. This is not the stew your mom made. It’s every bit as hearty and comforting but the flavors, ingredients and even the sides (did your mom serve stew with pita bread? I’m gonna guess that’s a no) are totally different. Moroccan spices permeate each bite. A wonderfully subtle earthiness from the lamb meat is complemented with lentils and chickpeas. It’s as if the traditional meat-lovers stew partied with staple vegetarian ingredients to create this perfectly balanced in-between meal. Lentils and chickpeas are both a variety of pulses – the dry edible seeds of plants in the legume family and these superfoods help bulk up the meal and bring an added boost of protein and fiber with very low fat. One serving of this stew can also help satisfy the Half-Cup Habit requirements, a great challenge to take on with the New Year! The garnish of fresh cilantro and yogurt brings a pop of freshness to the savory elements of each bite. Instead of rice (like my mom always served with stew), lightly toasted pita bread with some good sea salt is my recommendation to serve alongside. 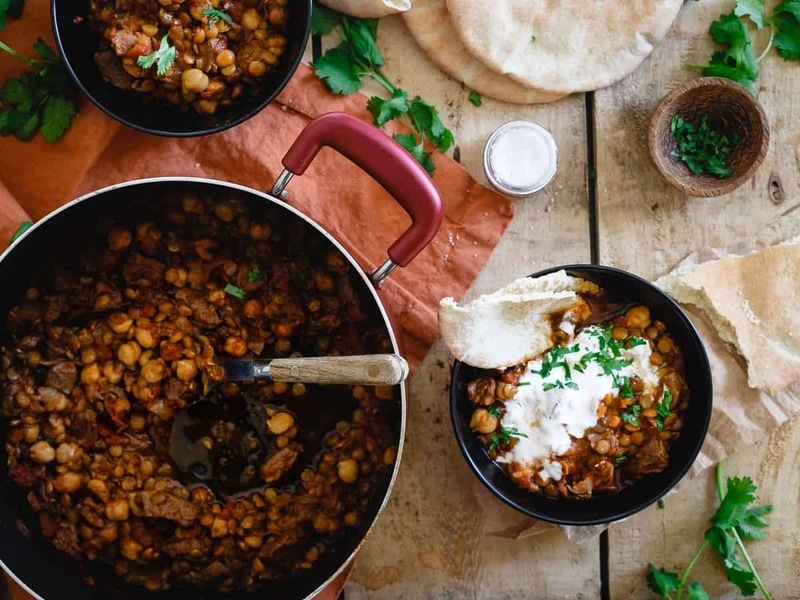 As we approach the New Year and all the healthy eating buzz that comes with it, you can bet I’ll be picking a bowl of this Moroccan lamb lentil stew over a salad. It’s January, who wants to eat cold food any way? 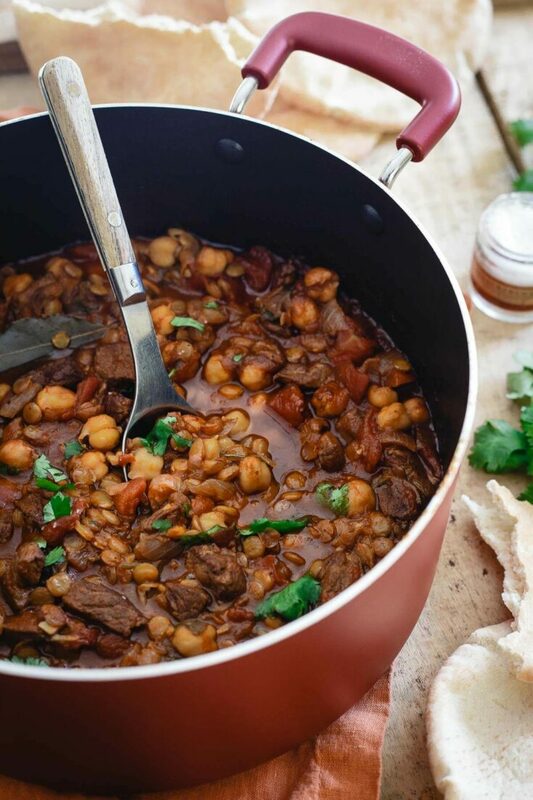 Love this recipe for Moroccan Lamb Lentil Stew? Place large Dutch oven or sauce pot over medium heat. Once hot, add olive oil and lamb. Season to taste with salt and pepper. Cook until browned on all sides, transfer to a plate and set aside. Add the onion and garlic to the pot. Cook until softened, about 3 minutes. Add the lamb back to the pot along with the tomato paste, bay leaf, paprika, cumin and cloves. Stir to combine and cook for 1 minute. Add the beef broth, diced tomatoes and cilantro to the pot. Bring to a simmer, stir then reduce heat to low, cover and cook for 45 minutes. Add lentil and chickpeas to the pot, stir to combine, cover again and cook another 20 minutes. Remove lid from the pot, cook an additional 20-25 minutes until stew is reduced and thickened. Season to taste with salt and pepper. Serve with more chopped cilantro, a dollop of yogurt and pita bread. I love lamb, this looks so comforting! We love lentils! Need to get this one on the menu! Happy New Year Gina! Hope the puppy is doing great! lentils are one of my favorites, so this definitely needs to happen in January. Aside from that, I’m with you – I’ll take a warm bowl of food over salad! This looks so hearty and delicious!! I could go for a hot bowl of this tonight! I adore lamb! This sounds perfect! I haven’t tried it in the slow cooker but I’d likely brown the meat first in the olive oil on the stove top then transfer to the slow cooker with all the ingredients except the cilantro, lentils and chickpeas. Cook on low for about 6 hours adding the cilantro, lentils and chickpeas the last hour or so. Let me know how it works if you try it! Having friends from the Middle East we’ve been eating this stew for several years. Their recipe is similar for the most part, but they add turmeric as well as the other spices. It’s wonderful any time of the year – we’re big on stews in our home. This is also a good stew without the lamb for those vegetarians out there. I love the addition of turmeric, great health boost, will have to use that next time! This looks so rich and comforting! I love lamb! Tried the slow cooker version. I reduced the stock to two cups instead of three. I transferred it to a pot after six hours, added the lentil chickpe and cilantro and let it cook for around forty minutes to cook them and thicken the stew. It was excellent. How much Tumeric would you use? This recipe is to die for. I had to make a few changes because of what I had on hand, but my changes are subtle, so I know the original is just as outstanding. I substituted allspice 1:1 for the ground cloves, added 1 teaspoon ground coriander (because I was slow cooking and didn’t want to add fresh cilantro to cook all day) and I also used beef versus lamb because it honestly, was too expensive, lol. I went with the slow cooker method mentioned before, mixed with a pressure cooker method: used 2 cups of broth versus 3, cooked on low (slow cook setting on my pressure cooker) for 6 hours. After adding the beans and lentils, I set my cooker to high pressure, 12 minutes, quick release. They came out perfect. (If you want to use the pressure cooker for both cooking times, the first cook time would be high pressure for 30 minutes with a 15 minute natural release, add lentils and beans, then high pressure again for additional 12 minutes, quick release).